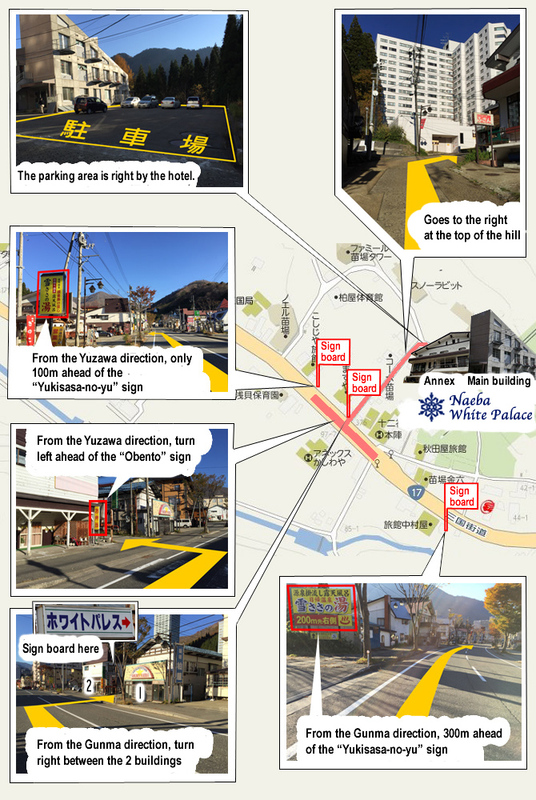 Access guidance and Google Maps to the white Palace Naeba Hotel for cars and public transport. Please take a safe trip. We are looking forward to your visits. About 120 min on Kanetsu st.
Take the wicket of Echigo-Yuzawa station. The right side is the east exit (bus stop). Go down the escalator on your right side and you will find the exit on your left hand. No.1 is Asakai bound the bus stop. Get off at the “ Asakai” bus stop. Return about 5m towards the Naeba Ski Resort, and walk through the side street where there is a sign of yellow lunch box., Walk for about 5 minutes and you will find the Asakai piste side entrance.